We're happy to announce that Parlor & Yard is the official home of PSUCenTex football watch parties. 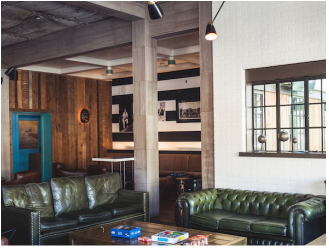 This spacious venue pays homage to an era when sports were America's past time and includes a full menu, comfortable and casual seating, a huge outdoor yard, and a great collection of interactive bar and board games. It's a fantastic scene and on Saturdays, Penn State is front and center throughout the establishment. We are family friendly for all 11am games! Please note our downtown venue has a 21+ age restriction for entry for games at 3:30pm or later. Show up a half hour before kickoff to get those first food and beverage orders in, meet, mingle and network with other Alumni and fans, and be ready for the kickoff. Dogs are welcome. Grab one of our $5 chapter cups for $1 off any draft beer and enjoy drink specials all game long. Don't miss our halftime raffle with proceeds benefiting our scholarship fund! From TX-1 Loop South/MoPac, take the 5th St. Cesar Chavez exit to W. 6th Street. From I-35 South, take Exit 234B and proceed to W. 6th Street. Head north on S. 1st Street and turn left on Lavaca St. In less than half a mile, turn left on W. 6th Street. From I-35 North, take Exit 234C and proceed to W. 6th Street.